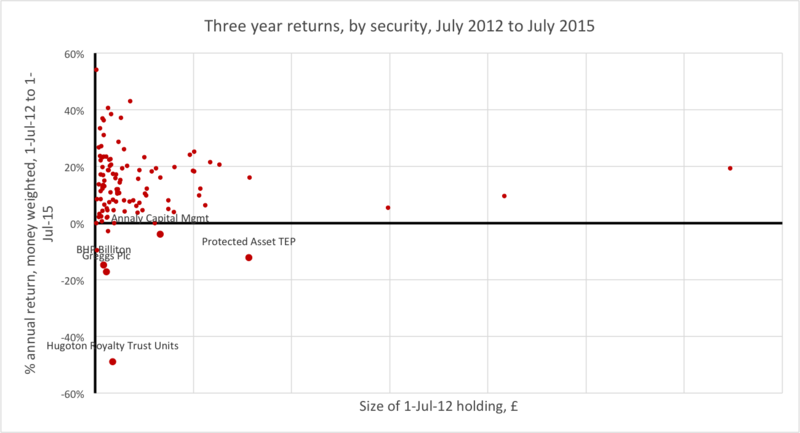 This is the third article examining the 100+ investments that I can track in detail*. Four significant investments made annualised returns of -10% per year or more, between 1/7/12 to 1/7/15, with a fifth chunky investment proving nearly as bad. In this post I’m going to examine these, my worst investments in this sample, in detail. (Other posts have examined the best six investments and the average performance). Was my original logic sound? It is possible that these investments might actually be ‘good’, but I am showing a loss in the 2012-2015 window – i.e. temporarily under water, but fundamentally sensible holdings. Were these investments avoidable? Even if the original logic was sound, perhaps there were warning signs I could have heeded? Did I trade in/out of these investments at the right time? Let’s look at these five investments in no particular order. Annaly Capital Management. Annaly is a US-based REIT. In effect it is a leveraged play on the US commercial real estate market. I confess to not knowing a lot about these, but being seduced by the crazy yields, against a backdrop that I haven’t believed US interest rates were as likely to rise as the market has often indicated. 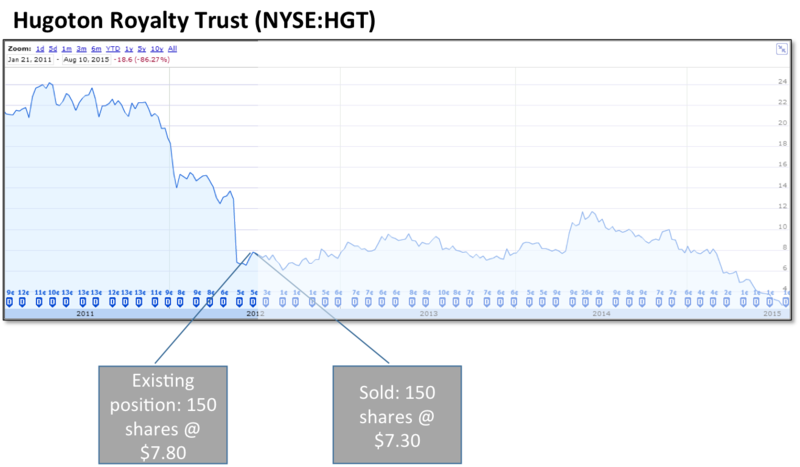 At the start of the reporting period I had ‘260’ (for the sake of argument – quantities are disguised) shares. Fear of rising rates has caused bond yields to go against NLY and the dividend has been progressively cut – even as it has done so the yield has remained >10%, i.e. the share price has fallen in line with the dividend, by about 40%. The yield remains >10% and I am left wondering whether I should recoup my investment by holding 4 years, or just bail out. I added in early 2014 at $10 and the share price has remained there with around $2 of dividends paid out since then. So my later Add has worked so far, but my initial position is still very underwater, even with around $5 of dividends in this period. Three year compounded average return: -4%. Was my original logic sound, or was this investment avoidable? If you can call it logic, then just about. But it was certainly avoidable too – yields of >7% per year are highly suspicious – and NLY is a very good example of why. Was I right to upweight my position? Yes, with a little bit of hindsight. Ask me again in 2 years’ time. BHP Billiton PLC. One of Australia’s mega-miners, an Australia exposure isn’t complete without either BHP or Rio Rinto. For personal reasons, my favourite is BHP. But back in 2012 I wasn’t a particular fan of the business model or the valuation; so my holding was pretty much for index-tracking purposes. I forget the reason I doubled up at Christmastime in 2012, but think it was due to upweighting my Australia exposure. What I do remember is my moves earlier this year, where I bought having concluded that the value metrics were significantly improved; while I recognise that China is down and commodity prices are down, I think BHP owns enough amazing assets and that long term China remains a Buy, so the key miner sourcing China is a unique asset. Unique assets, I like. Coupled with a decent dividend yield, this has become a Buy for me even as its share price has fallen from £17 to £10. I’m happy hurting, and am increasing my position. Was my original logic sound? I don’t quibble my original logic; I couldn’t have foreseen the move in sentiment on China, and I’m still buying even with prices a lot lower, so I think my logic here is OK.
Was this investment avoidable? I’m not frightfully well researched here, but Rio Tinto (BHP’s alter ego) has fallen very much in line with BHP, so I don’t think I’ve made a singular mistake. Was my timing good? Definitely not. Originally, no. Recently? Too early to tell. Maybe it’s a falling knife. Maybe it’s bargain of the century. I’m sanguine. Greggs PLC. 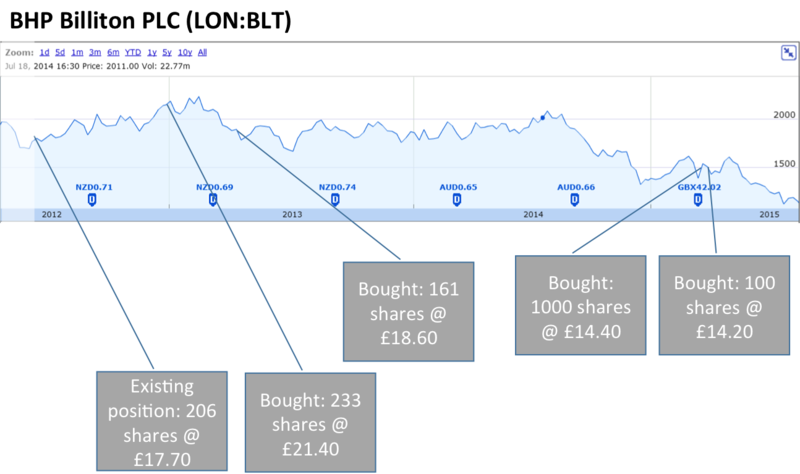 I opened my position in this UK retail baking business sometime around 2010; I bought into the idea that, as a relatively ‘downmarket’ retailer (selling sugary fatty foods), this business would outperform the rest of the retail sector in a prolonged downturn, which was what I anticipated. I knew very little about Greggs beyond this. My next memory is of it getting into a fight with George Osborne (a.k.a. the UK Government) about the taxable nature of pastries and sausage rolls, which it appeared to win. I think it wasn’t long after that I decided I’d held it long enough, without seeing any return materialise, and I had obviously got it wrong so I closed the position. 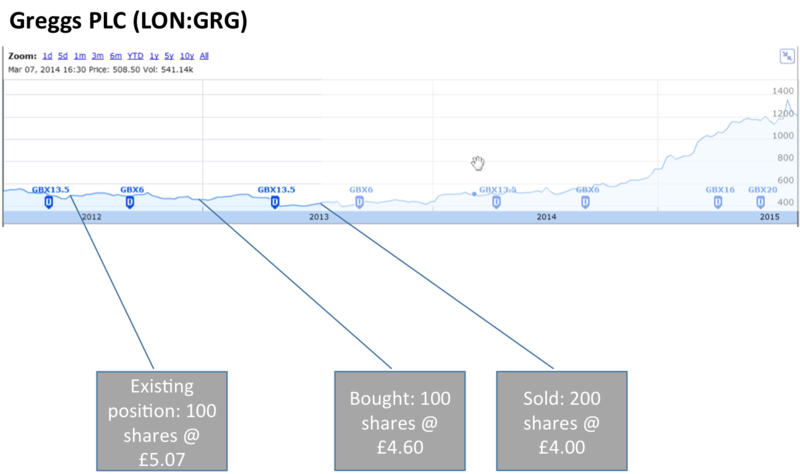 Six months later, hindsight shows, Greggs started its steady upwards march – and is now about triple what I sold it for. Doh. Was my logic sound? Barely. I’m afraid to this day I don’t know this business well enough to explain why it has increased in value so much since my original purchase. So I don’t know whether my macro-inspired call was right, but too early, or whether there is other stuff going on. Was this investment avoidable? Yes. I should have researched the business more thoroughly. Was my timing good? Definitely not. I should have held it longer; there wasn’t any obvious reason to sell other than lack of confidence. Protected Asset Group. 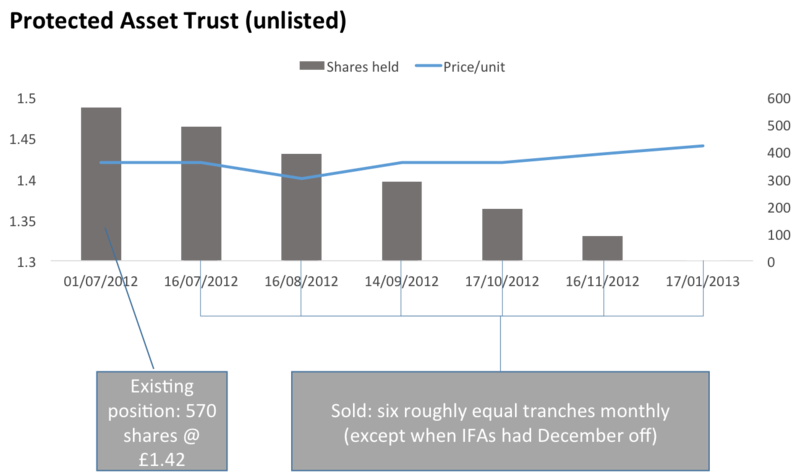 This holding is a funny one, sold to me by an IFA many years ago. Essentially it’s a small business specialising in end-of-life insurance policies, and the resale thereof. This market has been disrupted by regulatory pressure by the FSA/FCA and my company holding has become extremely illiquid. As a result the company has been forced to offer ‘distressed seller’ opportunities and their whole rhythm/momentum has gone. I’ve elected to take sell opportunities when they arise. The share price here has actually been pretty positive. So why is this holding showing a negative return? Your guess – you’re right – fees. The key consequence of the liquidity shenanigans has been hefty spreads/fees on any transaction, which have turned a mildly profitable investment into a properly negative investment. There’s a lesson in there somewhere, not very hard to find…. Was my logic sound? No. My investment was sold by an IFA. ’nuff said. Was this investment avoidable? Yes. Ignore anything an IFA suggests. Was my timing good? Yes, roughly, but this hasn’t helped me. Hugoton Royalty Trust. Ouch. This one is embarassing. Hugoton is a Royalty Trust which owns various oil/gas fields in the USA. I held a few positions like this from 2010 to 2012 and I am pained to admit it. Essentially I was chasing yield; these investments spat out a healthy high single digit yield and their share price remained pretty constant and that was about as far as I went. Then things went badly awry in 2011/12; I looked into things more closely; I realised that actually they were effectively doling out sales from fixed oil/gas fields, and in effect they were ‘selling off the family silver’. In the USA, gas has been hard-hit by the shale gas revolution which has rapidly depressed gas prices, so the family silver has plummeted in value. Once I realised the dynamics, I sold. Not in time to protect myself from the drop from $24 to $10/share. Ouch. Was my logic sound? No. Yield-chasing is highly dangerous. Was this investment avoidable? Yes. I should have understood Royalty Trusts better. Was my timing good? No, it was terrible. Yield-chasing will end in tears. Both Annaly and Hugoton are excellent examples of the woes that betide the unwary here. Risk results in losses. The overall portfolio I’ve analysed has done fine, and has some excellent investments in it. The quid pro quo is that I have some poor investments in it. This means risk. Risk is not a Bad Thing, it is just A Thing. Looking at things positively, these five Terrible investments reflect my appetite for taking risk, which generally has paid off for me. I shouldn’t grumble about the few double-1s I’ve thrown; I have also thrown some double-6s. Even hindsight is not enough. An analysis from 2012-2015 is still relatively fresh. I may well find in 10 years’ time that one of these ‘terrible’ investments has ended up alright in the end; certainly I am buying BHP at the moment. Do my own research. I need to do more. But I’m too busy. Which means my portfolio is too large, and I should shrink it to a level that I can research more thoroughly. This is my general approach but I struggle to work out how to prune it; this is a long game. NOTE: A key point about my methodology: my annual returns are calculated the Quicken way – which annualises returns over whatever period the holding is for. Thus although I report ‘annualised returns 2012-2015’, if the holding is held just for one month in mid 2013, and loses 1%, then this shows up as a (roughly) loss of 12% annualised for the whole period. Reader beware. It’s always difficult to trust your hunch that much, especially in the light of a few disasters that end up returning minus every year. Ask comes down to our risk tolerance vs. our greed for yield I guess. If only we were more emotionally stable as humans! Great article. Food for thought. 5) When averaging down only do it once stock out of the Major Downtrend – otherwise falling knife eg BLT. 6) time clearly a constraint – create System which allows for and avoids limitations – Research of Company is critical. Number 5 is my favourite – I’d never really understood how to distinguish a falling knife and this feels like a very solid suggestion. Thanks, WD!